In the sixteenth century Europeans started to come to America, and soon after that, they brought workers – slaves – from Africa. 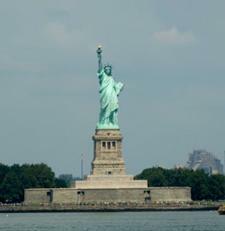 Large numbers of immigrants continued to arrive from all over the world until the middle of the twentieth century. The empty land was now full of people, speaking different languages and with different ideas. There are just three countries now in North America: Canada, Mexico and the USA. But there were nearly several more. The ‘United States of America’ was not always united. The 252 million people who live in its fifty states are not all the same. So how was the USA born? How did it grow? And what sort of country is it now? For thousands of years, America and its peoples were unknown to the rest of the world. The Vikings visited Canada from Scandinavia around AD 1000, but did not stay. Then, in 1492, a brave Italian sailor called Christopher Columbus reached the Caribbean, while he was looking for a sea route from Europe to India. Columbus did not stay either. It was only in the sixteenth century that the French, the Spanish, and the British all started to come and live in North America. In the early seventeenth century, two very different groups of English people made the dangerous journey across the Atlantic. In 1607, a group of farmers began the colony of Jamestown, in Virginia. They fought with the Indians, and many died because they were ill and did not have enough to eat. But Pocahontas, the daughter of an Indian chief, became a friend of Captain John Smith and helped him and the other English people. She later married a man called Pocahontas John Rolfe and went to England, where she died. The farmers discovered that it was easy to grow tobacco in Virginia, so they brought African people to work in the fields as their slaves. Smoking was becoming very fashionable, and the Americans found a big market for their tobacco in Europe. In 1620, another group of 101 English men, women and children arrived in Plymouth, Massachusetts. We know these people, who had very strong ideas about religion, as the ‘Pilgrims’, or ‘Pilgrim Fathers’. They did not want to live in England because they did not agree with the Church of England, so they sailed to America in a ship called the Mayflower. They became not only farmers, but also businessmen who bought and sold animal skins. They thought that all men were equal and so they did not have slaves. The Pilgrims too were often ill and hungry, and nearly half of them died in the first year. But they were helped by friendly Indians, who showed them how to grow corn. 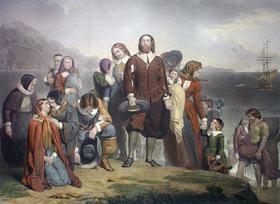 In the autumn of 1621, the Pilgrims had a big dinner to give thanks for the first food that they had grown themselves. This day became known as Thanksgiving, and Americans still celebrate it every year, on the fourth Thursday of November. It is one of the most important holidays in the year, and people often travel many hundreds of kilometres to be with their family. By 1770, there were thirteen colonies along the east coast of North America, all governed by Britain. But Britain was a long way away, and the people of the colonies became angry at the high taxes that the government made them pay. In December 1773 a group of men threw 342 boxes of tea into the sea at Boston because they did not want to pay the British tax on it. This was the ‘Boston Tea Party’. The British government was now angry too, and in April 1775 some Americans fought a group of British soldiers at Lexington and Concord, in Massachusetts. A few months later, after the Battle of Bunker Hill, near Boston, it was clear that Britain was at war with its American colonies. A farmer from Virginia, George Washington, became the leader of the American army. But the colonies did not say that they wanted to be fully independent until the summer of 1776. 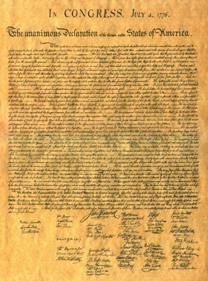 Thomas Jefferson wrote the famous ‘Declaration of Independence’, where he said that the king, George III, had broken his agreement with his people, because he had not let them have their rights: rights to life, freedom and happiness. The day of the Declaration of Independence is another important American holiday, celebrated each year on July 4. The Americans finally won the war five years later, in October 1781, and two years after that, they were free to govern themselves. 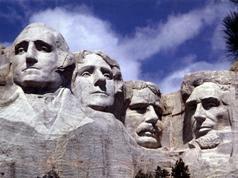 In 1788 they made George Washington their first president. This great country of 31 million people was known as the Union, but in fact there were deep differences between the North and the South. And in 1861 war broke out – the most terrible war that the world had ever seen. At least 600,000 people died in the fighting or from illness. The war was fought to keep the United States united. It began because the southern states kept slaves to work in the cotton fields. Slaves were not allowed in the North, and the two sides argued about whether they should allow them in the new lands of the West. In 1860, Abraham Lincoln, who belonged to the Republican party, which was against keeping slaves, was elected president. On December 24, South Carolina said that it wanted to be independent and the other southern states soon followed; they called themselves the ‘Confederate States of America’. The fighting began on April 12 1861, at Fort Sumter. The South had some of the best soldiers – one was the great Robert E. Lee – and they had plenty of money from selling their cotton to England. But the North had more men and more factories.They also had Lincoln, one of the best presidents that the USA has ever had. Two famous soldiers helped the North to win the war: General Sherman is remembered in a famous song about how he took 60,000 of his soldiers on a journey from Atlanta, in Georgia, to the Atlantic coast, breaking the Confederate states in two; after the war, he became head of the American army. General Ulysses S. Grant was the man who represented the North at Appomattox in 1865, when the South, under Lee, accepted that they had lost the war. Grant was very fair to Lee’s soldiers, who did not have to go to prison. Some years later, in 1868, he became president. Sadly, in April 1865, just after the end of the war, Lincoln was shot at the theatre by a man called John Wilkes Booth. After Lincoln’s death, the new president was not strong enough to bring the North and the South together. Anger and arguments, mostly about the rights of black people, continued. During the nineteenth century, more and more people went to live in the West. Most of us have seen the ‘Wild West’ in films and on television, and so we think that it was full of cowboys and fighting. But in fact there were very few cowboys – no more than 40,000 – and real cowboys did not shoot each other very often. They were hard-working men, and at least a quarter of them were black or Mexican. They took cows from Texas up to the railway towns in Kansas and Missouri to be killed for meat. From there, the meat was sent to the East and sold. The cowboys almost disappeared after about thirty years because the land was given by the government to farmers and their families. From 1862 to 1900, more than half a million farmers came to live in the West, where they grew corn and other crops instead of keeping cows. The farms were very lonely, but soon the railways helped to bring people together. In 1869, the railway line from the East met the line from the West in Utah, so it was possible for Americans to travel right across the USA by train. At the beginning of the nineteenth century most American families had come from Britain, Germany and Scandinavia, and they were farmers or businesspeople. But soon that began to change. Factories were built and cities grew; poor people arrived from other countries, hoping to find work. Between 1840 and the end of the century, about five million people came from Ireland alone. Another five million immigrants came from Italy, and millions more from Russia, Poland and other countries of Eastern Europe, hoping to find jobs and freedom. America kept an ‘open door’ until 1924 and about 27 million people arrived between 1880 and 1930. They were often poor, had different religions, and had not been to school for very long; there was a lot of prejudice against them. The Chinese immigrants in the West also met with prejudice. Many people came to live in California after gold was found there in 1848, and among them were 300,000 Chinese. Many of the Chinese stayed to work building the new railways. Like black people and Native Americans, the Chinese had no civil rights and after 1882, they were no longer allowed to enter the USA. The Irish, Italians and Eastern Europeans usually stayed in the big cities of the East or the Mid-West, like New York, Boston or Chicago, and worked in the factories. 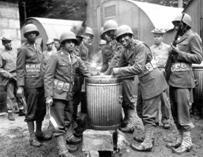 Although most of them learned English and became Americans, they also wanted to keep their own way of life. So in many cities you can find places known as Little Italy or Chinatown, where the restaurants have Italian or Chinese food. This is all part of what makes America an interesting and exciting country. Today about 30 million of the 252 million people in the USA are black. They used to live mostly in the South, working in the cotton and tobacco fields. After the Civil War, white Southerners were angry that they had lost the war and angry that slaves were now free. They showed a lot of prejudice against black people. Some whites joined the Ku Klux Klan, groups of men who dressed in white, covered their heads so that no one knew them, and went out to beat and murder black people. Black men could not vote until 1870, and even when they got the right to vote, they often did not use it because they were frightened. In the twentieth century, black people began to travel to the cities of the North and later, to California, to look for work, so there are now more black people in the North than in the South. But even in the North, they lived separately, and in the South they had to sit separately on buses and eat in separate parts of restaurants. Until 1954, they also had to go to separate schools. In 1964, a law was passed giving black people their civil rights and Dr King was given the Nobel Peace Prize. But in 1968, Dr King was murdered in Memphis, and fighting broke out in more than a hundred cities. During the 1970s and 1980s, prejudice against black people lowly began to become less important, and many black people now have good jobs in business and government. However, there are still problems, as was shown by the fighting in Los Angeles in 1992, after a black car driver was beaten by white policemen. The government of the USA has three separate but equal branches: Congress, the President, and the Supreme Court. Women were given the vote in 1920 and all Americans can now vote when they are eighteen years old. Congress makes the laws. There are two ‘houses’ of Congress: the Senate and the House of Representatives. There are a hundred people in the Senate (two from each state) and they are elected for six years. There are 435 people in the House of Representatives, and they are elected for two years only. States with more people, like California, have more Representatives. Some states, like Wyoming or Delaware, which do not have many people, only have one Representative. The President is head of the departments of government which carry out the laws. He (until now the president has always been a man) is the leader of the country (like a king or queen) and head of the army. He is elected for four years, and can only be elected twice. He can say ‘no’ to laws passed by Congress (but Congress can also say ‘no’ to him), and he chooses the judges for the Supreme Court. He lives and works in the White House in Washington DC. The Supreme Court is the most important court in the country and has nine judges; their job is to decide what the laws mean. They can also say that Congress has made a law which is wrong, or that the President has done something wrong. 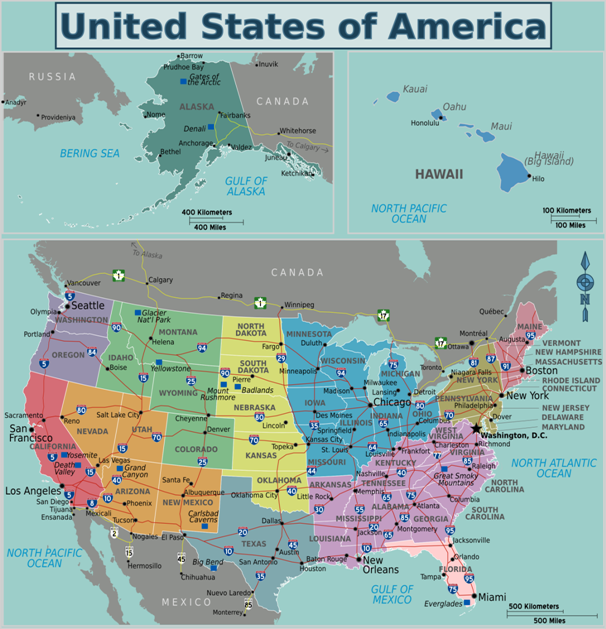 The USA is a union of fifty states, and as well as the national government in Washington, each state has its own government. Laws can be very different from one state to the next. They say very different Inside Congress things about, for example, how old you must be to vote, get married, leave school or drive a car. Different states punish criminals differently too; in some states, you can be killed for murdering someone, in others you only go to prison. Most Americans who have jobs live more comfortably than people in any other country in the world. They usually work a forty-hour week and they have two weeks’ holiday a year as well as the official holidays like Thanksgiving and Christmas. In 60% of families, both the husband and the wife go out to work. Although more than 40% of the land is farmed, not many people work as farmers, and fewer Americans work in factories than in the past. Most jobs are now in hospitals, banks, hotels, shops, etc. If they don’t want to go out, Americans can always stay at home, and watch television. Nearly all families have a TV and it is said that an ordinary family watches seven hours a day! They have over 10,000 TV stations to choose from, most of which are owned by private companies, not by the government. Few newspapers cover all the USA, but you can buy papers like the New York Times and the Washington Post everywhere, as well as the magazines Time and Newsweek. Most Americans enjoy sports, which helps to keep them healthy. Their favourites are baseball, basketball, football and ice hockey. American football is very different from European football; players run and carry the ball more than they use their feet. What do Americans eat? In the past, America gave a number of different foods to the rest of the world: potatoes, tomatoes, chocolate and corn, for example. Today, American ‘fast’ food is sold in restaurants in almost every country of the world. The most famous examples are probably hamburgers and hot dogs, eaten with french fries. Boston, where the fight for independence began in the eighteenth century, is one of the oldest cities in the USA. 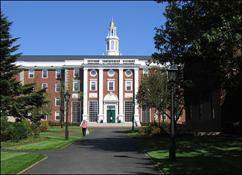 In neighbouring Cambridge is the oldest university in the USA, Harvard, which was opened in 1636, as well as the famous Massachusetts Institute of Technology (MIT). Perhaps the most well-known family in twentieth-century Boston was the Kennedy family. Like many other Boston families, they came from Ireland. They became very rich, and John F Kennedy, a Democrat, became President of the United States in 1960. At that time he said ‘. . . ask not what your country can do for you, but what you can do your country’ He and his beautiful wife Jacqueline were young and popular, but sadly, in 1963, ‘JFK’ was shot and killed in Dallas, Texas. Everyone knows New York, the biggest city in the USA. It is a great place for theatre, shopping and restaurants. 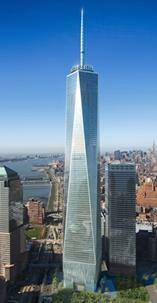 It is also the home of the United Nations, whose offices are in a beautiful glass skyscraper. Chicago and the other cities around the Great Lakes of the Mid- West have more factories than anywhere else in the USA. Detroit, on Lake Erie, is where cars are made and it is also known as one of the homes of black popular music. Henry Ford, who made the famous Ford cars, was born in Michigan, near Detroit. His ‘Model T’ (1908) was the first car cheap enough for ordinary people to buy. ‘Anyone can drive a Ford,’ they said. Lying between Canada and the USA, the five Great Lakes are an important route for ships travelling from the Atlantic, along the St Lawrence Seaway, to the Mid-West. Together, Lakes Erie, Ontario, Huron, Michigan, and Superior cover 244,108 square kilometres – more than any other group of lakes in the world. If you go there in the summer, it is almost like going to the sea; you can lie on the beach or sail a boat. But in winter it is very cold. Chicago is sometimes known as the ‘windy city’ because of the cold winds that blow in from Lake Michigan. Thousands of kilometers south of the Great Lakes is the state of Louisiana, which used to be French. The city of New Orleans, on the great Mississippi river, is famous for its food, which is like French and African food together, and for Mardi Gras, when people celebrate by dressing in colourful clothes and walking or dancing through the streets, playing music. New Orleans is also the home of jazz, which was first played by black musicians like Louis Armstrong in the 1920s. The USA has some of the biggest cities in the world, and more than three quarters of its people live in cities or towns. This means that there are also some very empty places, which have not changed much since the first Europeans arrived. The government has kept some of them as National Parks, where people are not allowed to build houses or factories. The wonderful Rocky Mountains, Skiing in the Rockies for example, in the states of Wyoming, Montana, Colorado, Idaho and Utah, are great for holidays. Visitors like to go there for walking, climbing, fishing, hunting, or horseriding. You can also go skiing in winter at towns like Aspen. The only big city in the Rockies is Denver, which is one mile (1.6 kilometres) above the sea. The air is so thin there that it can make your head hurt when you first arrive. South of the Rockies lies the desert state of Arizona, where the land has fantastic colours: not just brown and green, but red, pink, orange and blue. The most famous place in Arizona is the Grand Canyon. This deep river valley was made by the Colorado river cutting through the rock many thousands of years ago. Today it is 2,000 metres deep, 349 kilometres long, and between six and twentynine kilometres wide. You can walk down to the river, but it will take you two days to get there and back, and you must take plenty of water to drink. You can also fly over it, and see the extraordinary shapes of the rocks. Next to Arizona, New Mexico is another dry, desert state, where farming is difficult and the people are poor. Many Native Americans live there on big reservations. The Navajo, Hopi, Pueblo and Zuni are known for the beautiful things that they make from silver, for their colourful blankets, their pots and for their dancing. Many artists have also come from other parts of America to live in and around Santa Fe and Taos. California is a state of differences. It has the lowest, driest place in the USA: Death Valley, which is 86 metres below sea level. It is very hot there (56.7°C on the hottest day, in 1913) and in some years it does not rain at all. But the north of the state is quite cold and wet. This is where the great redwood trees grow – the biggest trees in the world. California grows more fruit and vegetables than any other state in the USA, and it is famous for its wine. But it is also a centre for computers and business. It has more people than any other state. San Francisco is, many people think, one of the most beautiful cities in the world. It was nearly destroyed by an earthquake and the fire which followed it in 1906. There was a big earthquake in 1989 and everyone knows that one day, perhaps very soon, there will be another, but they continue living in San Francisco because life there is fun. 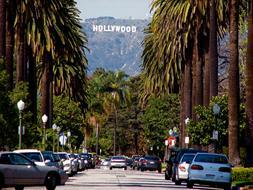 Los Angeles is the second biggest city in the USA. It can take hours to drive from one side to the other – and people almost always drive! The number of cars means that the city has a problem with dirty air; it also has a lot of violence. But visitors still come to see Disneyland, Hollywood, where films are made, and Beverley Hills, where you can look at the houses of famous film stars. Travelling north from California, you come to Oregon and then Washington. These states are cool and wet, but very beautiful, with big forests and high mountains. Since the 1980s, Seattle has become one of the most popular cities in America; it is the home of new music and of coffee bars selling lots of different types of coffee; films and TV programmes are made about people who live in Seattle. A city that was once quiet is becoming crowded and expensive. Away across the country is another city which has changed a lot in the last twenty years: Atlanta, Georgia. It is big and modern, with one of the busiest airports in the world; the Charleston Seattle Olympic Games were held there in 1996. There are plenty of jobs, and people think that, like Seattle, it is a comfortable city to live in. It is very different from the old cities of the south: Savannah, Georgia, and Charleston, South Carolina, for example, where there are still many beautiful old houses which look the same as they did 150 or more years ago.